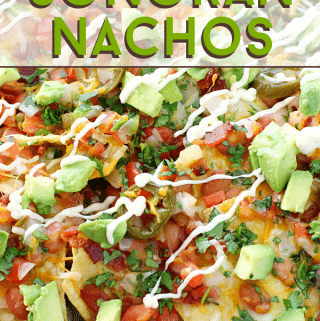 Your game day just got a whole lot tastier when you serve these Bird Gang Sonoran Nachos! 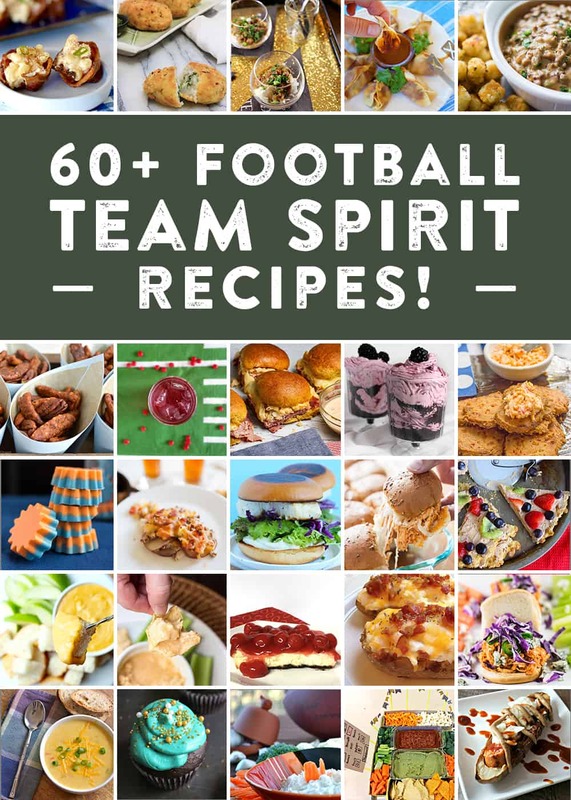 Post includes more than 60 football team spirit recipes! Are you familiar with the Sonoran Dog? When Brian and I first moved to Phoenix, I told him that I had heard about them and was dying to try one. One night while we were out, I told Brian I wanted to find one of these Sonoran Dogs to see what all the hype was about and I heard Nogales Hot Dogs was one of the best stands in the valley! If you’re ever in the Phoenix area and want to check it out, Nogales Hot Dogs is a small stand near 20th Street and Indian School Road – and to my knowledge, you can only find them serving their famous Sonoran Dogs at night! Those Sonoran Dogs were everything I had hoped they would be and so much more! I loved the speedy service and it truly was one of the best hot dog combinations I’ve ever had. Although there are a few places to find a Sonoran Dog here in the Southwest, I really enjoy Nogales Hot Dogs. So what exactly is a Sonoran Dog? It’s a hot dog wrapped in bacon and cooked, then, it is covered in mayo, tomatoes, beans, onions and a variety of other sauces, typically served with a roasted pepper on the side. It is the bomb. 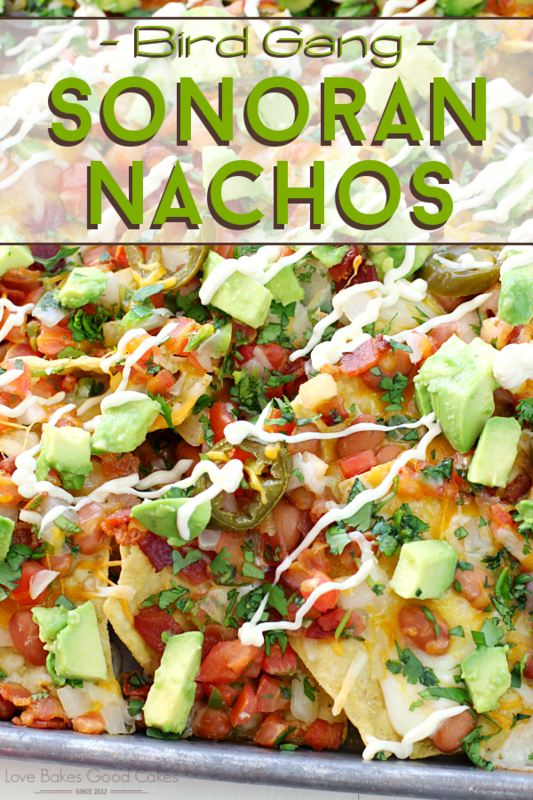 When thinking of a way to shake up our game day snacks, I decided to give these Sonoran Nachos a try. 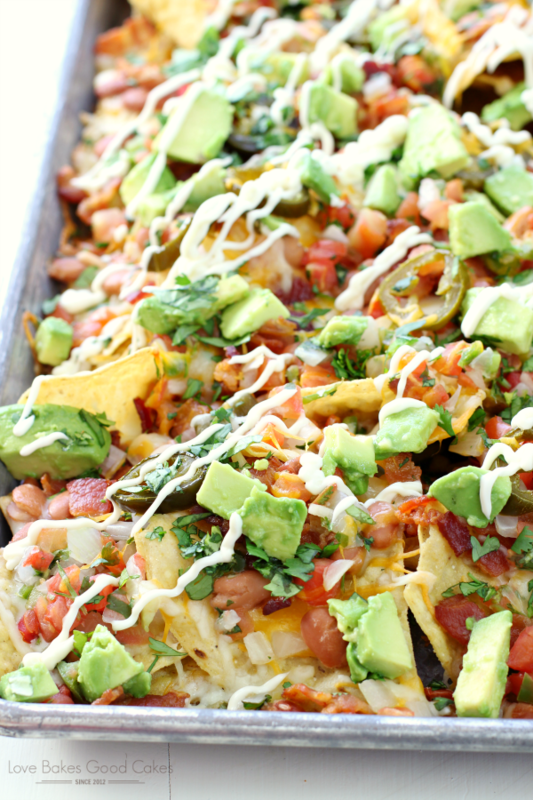 Y’all, this just might be my family’s favorite nacho recipe of all time! I put everything we love on those Sonoran Dogs, on top of tortilla chips and baked them until everything was all melty and delicious! I debated on whether to add chopped hot dogs to the nachos but ultimately decided against it. Feel free to add some cooked, chopped hot dogs if you would like – I think it would be even more authentic! 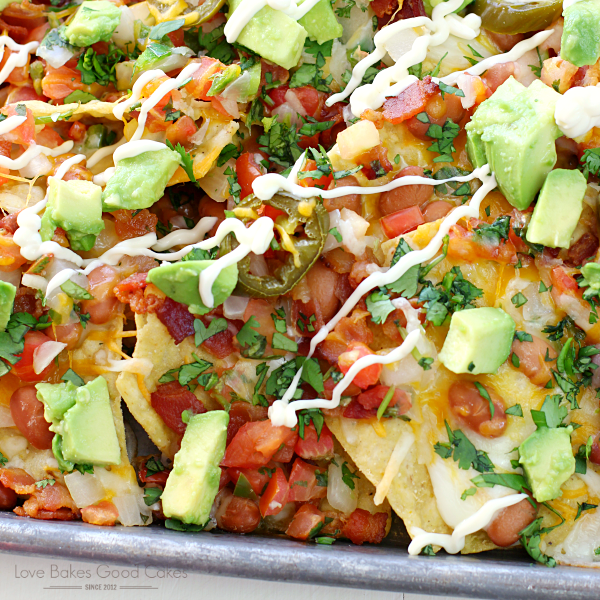 Feel free to adjust the amount of the ingredients to your family’s desired preference … we like our nachos LOADED! Football season is here! In celebration, I’ve joined a group of bloggers from all over the country — all of whom are big football fans! 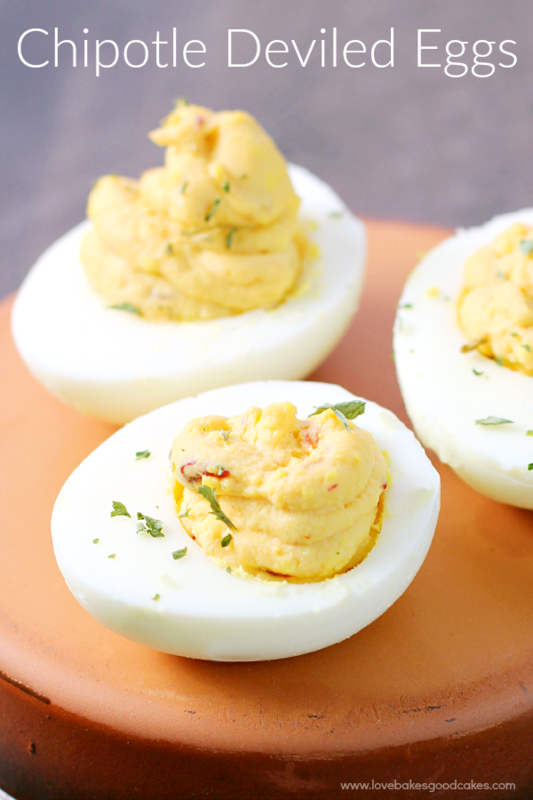 — to bring you football-inspired recipes this season. Last month we shared our favorite tailgating recipes, and now we are sharing more than 60 recipes ideas for celebrating on game day. Click on their links below at the bottom of this post to join in on this month’s tasty game day grub! Preheat oven to 400°F. Lightly spray a baking sheet with nonstick spray. Place tortilla chips in a single layer on the prepared baking sheet. Top with half of the cheese. Top with all of the beans, bacon, pico de gallo, and pickled jalapeño nacho slices. Top with the other half of the cheese. Place in the oven and bake until heated through and the cheese melts about 5-8 minutes. Top with cilantro, avocado, and a drizzle of mayonnaise. Serve immediately. 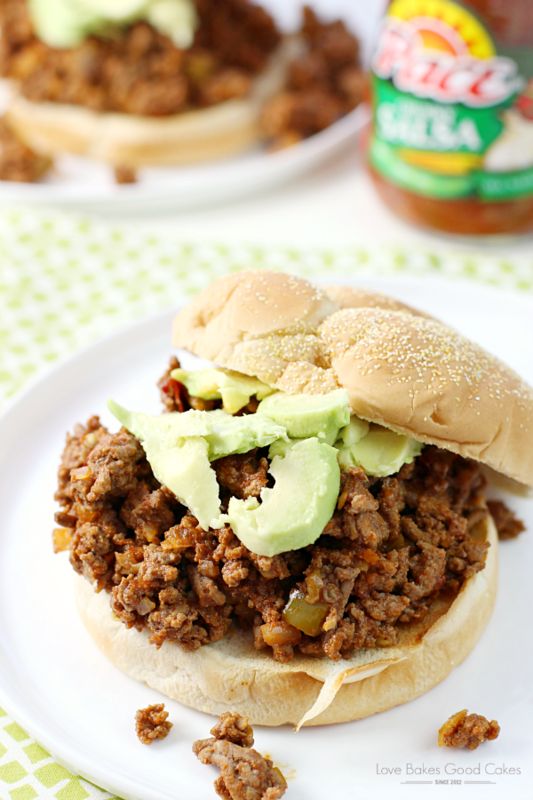 I have never heard of sonoran dogs, but I love anything in nacho form so I'd be happy to give these a try!